Maca root is an ancient cultivated Peruvian edible, fleshy taproot known for its food and medicinal values. The root, also nicknamed as Peruvian ginseng, recognized as a natural adaptogen and energy booster, implicated to stimulate body metabolic functions and to improve overall wellness and health. Botanically, maca belongs to the Brassicaceae family of vegetables, and closely related to brocooli and turnips. Scientific name: Lepidium meyenii Walp. Some of the vernacular names of this root are pepper weed, maka, mace, maino, ayak chichira, ayuk willku, etc. Maroon and yellow maca roots. Photo courtesy: inyucho. The plant is a perennial herbaceous perennial, which reaches about 6-8 inches above the ground with downy, spreading, parsley-like leaves. After about 180 days after seedling, its beetroot-shaped hypocotyls (taproot and hypocotyls) ready for harvest. The taproot, which is the edible part of the plant; varies in size from 1-2 inches in diameter with thin, elongated, tapering stem. There are four distinct cultivars of maca root grown in the native Andes Mountains. Yellow being the most common ecotype followed by purple, purple-blue and black root varieties The roots differ in their color depending up on anthocyanin pigments concentration in them. Black maca treated as prized item in traditional medicines. Maca root is moderate in calorific value. 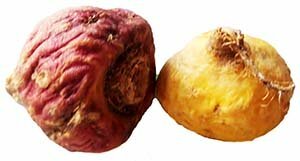 It is the only Brassica family taproots that is rich in starch; hence, fresh maca carries slightly more calories than other taproots like turnips and radishes. On the other hand, 100 grams of dry maca powder holds about 325 calories; equivalent to that of some cereal grains like rice and wheat. Fresh as well as dry maca contains no cholesterol and has very small quantities of fat. Nonetheless, the root contains several noteworthy phyto-chemicals, mineral and vitamins, which boost vitality, freshness and general wellbeing. Apart from the major constituents, maca root and other plant parts endowed with health benefiting anthocyanin pigments, alkaloids, tannins, etc. Maca plant parts traditionally believed to increase energy levels. Ancient Incas used maca root parts to improve fertility and as aphrodisiac and to regulate menopausal and menstruation symptoms. Researchers working on maca confirmed that certain active compounds like macamides and macaenes are primarily responsible for its physiological actions on the human body. Maca root powder is an incredibly rich source of vitamins and minerals. 100 g off maca powder consists of calcium- 250 mg, iron- 14.8 mg, potassium-2000 mg, sodium-7.9 mg, copper-6mg and manganese- 0.8 mg. Much of these minerals are integral part of maca nutrition which plays a role as co-factors for the enzymes in the metabolic functions. Commercial maca products have gained popularity as dietary supplements for aphrodisiac purposes and for increasing fertility and stamina. However, scientific evidence on its effectiveness is limited. Traditionally used as staple food by the the indeginous tribes, maca root later transcended as chief medicinal herb under the Inca empire when its warriors using it to revital enrgy before embarking on battles. Maca powder used in many Chinese TCM mixed with other synergic herbs like ginseng, spirulina, tribulus, rhodiola, ashwagandha, etc to combat stress, fatigue, nervous weakness, and to improve muscle strength, sexual performance, etc. Maca root (Lepidium meyenii Walp. ), Dry powder, Nutrient value per 100 g.
Traditionally, maca roots harvested by hand once its top greens turn yellow. Fresh roots usually available only from the farmers near its cultivation. In the US markets, dried tubers, powder, and chunks in vacuum packs can be readily available from specialty food stores. Look for the uniform sized, well-dried roots in authentic packages. Fresh roots keep well for several days in the cold storage. Dried maca root and powder can be stored for several months. Fresh roots eaten baked like other taproots like turnips. Dried roots soaked for few hours in lukewarm water to revive their texture. Today, however, much of the maca crop is utilized by the pharmaceutical industries to process and market as food-supplement instead of vegetable. Traditionally, native Incas baked fresh roots in the earthen-owen (pachamanca), along with potato, corn, sweet potato, meat, guinea pig and herbs. Novelty maca products drinks, energy bars, or as additive in smoothie or chocolate drinks. Maca root, being member of broccoli family vegetables, does not cause much toxic problems if consumed in moderate quantities. (Medical disclaimer). Conumption of maca root has not been established to treat thyroid dysfunctions. On the contrary, being a brassica family vegetable, maca contains goitrogens, and may in fact, may worsen hypothyroidism and should be consulted with physicians before using maca supplements. Maca root is a kind of underground, taproot (hypocotyl) of plant L. meyenii, native to highland mountain plateus of Peru. In a way similar to the other taproots such as turnips, parsnips, etc, maca root nutrition consists of basic calorific (ex; carbohydrates) and phytochemical nutritional profile like some anti-oxidants, vitamins and minerals. Fresh roots carry slightly more calories than turnips and potatoes. Once dried, its calorific value per 100 g is equal to cereal grains like wheat and rice. Some pharmaceutical trial studies suggest that the consumption of maca root products would help improve sexual vigor in men and women. However, further research studies required to substantiate this claim. Ancient indigenous and Inca people chiefly used maca as basic food source; dry as well as fresh roots often barterd in exchange for corn, potato, pulses and meat with lowland people. So, native Andeans treated it more as a food item than a "novel fitness root". Although, maca carries number of anti-oxidant compounds, its value is no way closer to other antioxidant rich superfoods such as cinnamon, blueberries, etc as claimed by some companies, websites, and articles. The USFDA, on its part, not even bothered to publish its nutritional profile and ORAC value. <<-Ginseng nutrition facts and health benefits. <<-Back to Herbs from Maca root nutrition. Visit here for an impressive list of all variety of herbs with complete illustrations of their nutrition facts and health benefits.